Opening May 21, LYFE Kitchen will offer a variety of healthy food options — all under 600 calories. When life gives you lemons, you’re supposed to make lemonade. But what happens when LYFE Kitchen gives you a plate full of food? You eat it. LYFE Kitchen, 1603 Orrington Ave., is set to break into the Evanston eatery scene May 21 with a bold menu featuring fresh, low-calorie food. With three open locations in California and one in Chicago’s River North neighborhood, LYFE Kitchen co-partner Nate Cooper said Evanston was a logical next location. Cooper said the LYFE Kitchen menu truly features something for everyone, whatever their dietary needs may be. Dishes for omnivores, herbivores and carnivores are all available, and each item is under 600 calories. In addition to LYFE’s attention to healthy, fresh food, the restaurant puts a high priority on sustainability. Gail Taggart, president of L3 Hospitality Group, said the building LYFE is in, once the lobby of a bank, is LEED certified with environmentally friendly features like tables made from recyclable materials and non-toxic paint. Additionally, Cooper and Taggart said they plan to get very involved with the community. The restaurant is already a member of the Evanston Chamber of Commerce and Downtown Evanston, and Cooper said they plan to get Northwestern students involved in the restaurant, too. Ultimately, Taggart emphasized the restaurant’s unique ability to offer a high-quality product that leaves customers’ stomachs full but doesn’t empty out their wallets. “We’re offering sort of that sweet spot between being really tasty food and a really casual environment within a really reasonable price,” Taggart said. Taste: My absolute favorite salad contains candied nuts and goat cheese. First of all, it’s way more sophisticated than your classic lettuce and dressing combination because it contains cheese that comes from a goat. Second of all, the pecans are crunchy, and as someone who puts potato chips on her turkey sandwich, I appreciate the crunch. LYFE’s version of this salad was delicious. The tangy dressing complemented the meaty taste of the arugula nicely, and the sweetness of the cheese paired excellently with the crunchy nuts. Taste: I’m not going to lie: I literally don’t know what all of those ingredients are. What I do know is that the combination of these fancy mysteries made my tastebuds quite pleased. Now, chicken wings probably aren’t on Jenny Craig’s menu, but even those people who are watching their calories can enjoy these buffalo chicken strips. The grilled meat was tender, and the sauce packed quite a punch. I’m not particularly fond of mustard, so I found the dijon vinaigrette a little bit overpowering. Although, the brussel sprouts, squash and cranberries were amazing. I actually enjoyed eating brussel sprouts, and that is no small feat. 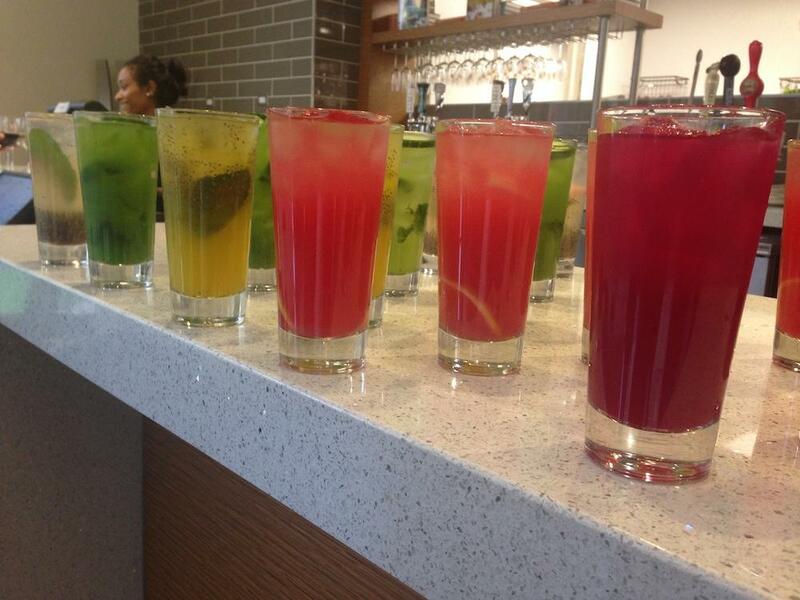 Taste: LYFE features a rainbow of fresh, fruit-laden LYFE waters. Ranging from hibiscus beet and organic ginger chia seed to cucumber mint and ginger mint chia, there are a ton of flavors to choose from. I drank a glass of lemon-pomegranate LYFE water, and not only was it refreshing, but it was not overly acidic, so my teeth didn’t feel gross after drinking it. Between flavor-packed bites of food, the LYFE water was an excellent palate cleanser.